Wow, what a great day everyone! 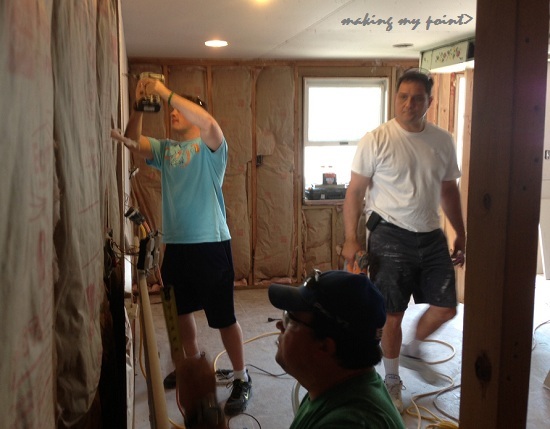 Saturday, June 15th, 2013 about 25 volunteers gave their time to “lend a hand” to rebuild the Long Island Toy Lending Center For Children With Disabilities, here in Point Lookout, that was destroyed in Superstorm Sandy. Right off the bat… My apologies to anyone who came and helped that didnt make the pictures or this post. 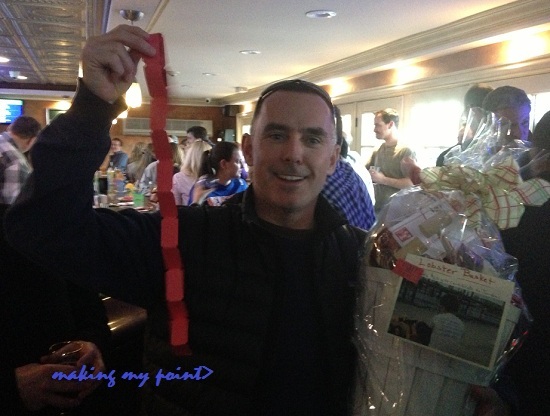 Thanks to Ted, Anthony and others… feel free to drop me a line, so we can recognize those who helped. 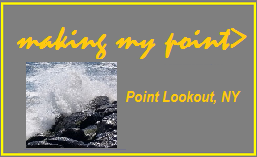 If you have any pictures to share, just drop me an email at makingmypointNY at gmail and / or let me know where you may have posted them! Wish i had better pictures but I didnt want to stop the work to get them! John, Eric, Ed, Joe and Mike actually stopped for a second for this shot! Colleen, with volunteers Carolyn and Nancy with Mary (Hidden) and Kevin. Father and son Kevin and Kevin with Joe really rocked the place! It was great to work with all of you. We really accomplished so much and it was great to see everyone come together to help get them back up and running. 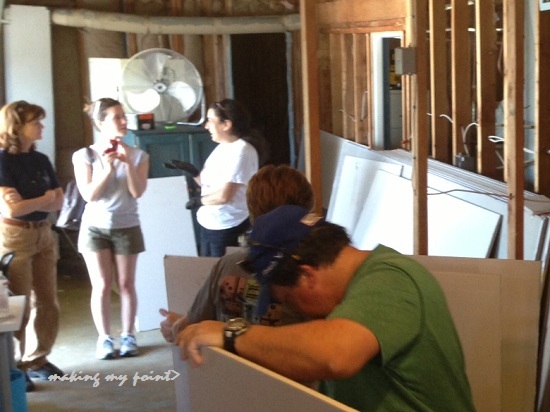 The good news is we put a major dent in the interior work to be done, and also if you didnt get a chance to help… they still need you! There is still so much that remains to do there, so feel free to pitch in! 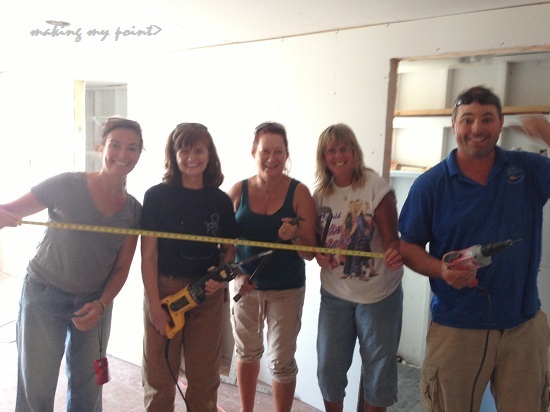 Give Colleen a call or email her at LIToyCenter@Gmail.com to see when the next work day will be. Ill keep you posted, too. Hopefully, I’ll see you next time! Photo courtesy Jonathan Spector Photography. 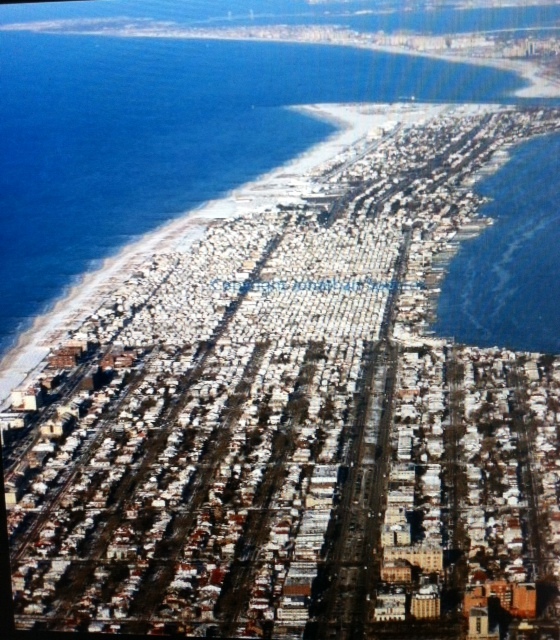 Aerial of Long Beach, Atlantic Beach and the Rockaways. Taken while flying in from Puerto Rico on JetBlue in February, 2008. Has anyone else been at the Coffee Nut Café by Pier 1 in Long Beach lately? I was there about a week ago for my usual fill ‘er up (I live and breathe by the Peruvian organic!) and was astounded with the new artwork on the walls. There is an incredible showing of photos from Jonathan Spector, mostly taken around, above and off of Long Beach, as well as from around the world. I had seen this aerial shot of Long Beach as a mind blowing raffle prize at the recent Project Pay It Forward event to help Swingbellys. Then, as if on cue, at the Coffee Nut, here were more astounding shots that blur the line between photography and surreal paintings. I have to say, I’m enamored of the ones showing that were taken from inside and under waves off Long Beach. Probably “The Curl” is my favorite. A visual reminder of the feel of being inside the tube of a wave- one of my favorite mental images. It puts me right there in fond memories of some of the best days I have spent in the water. Photo courtesy Jonathan Spector Photography. 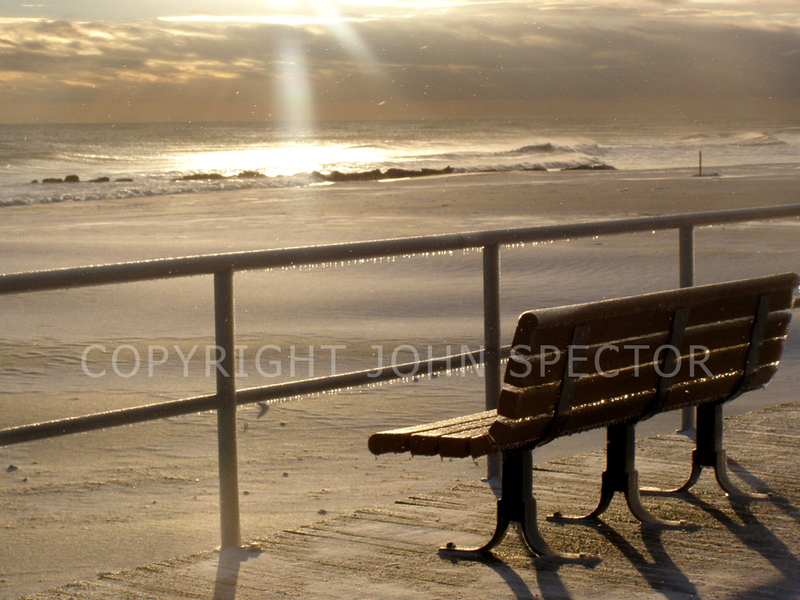 Valentines Day, 2008 during an ice storm in Long Beach. You need to see his work. In person is definitely worth the stop. The showing will be ongoing at the Coffee Nut Cafe. See if you can’t get a cup of Jamaican Blue Mountain while you’re there. It’s worth the extra few cents, a treat that you can’t usually get elsewhere! 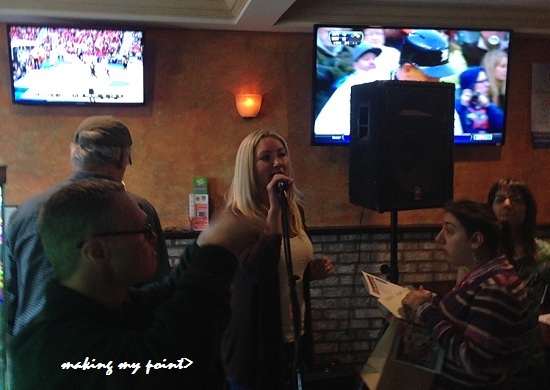 It was fun to see some of you last Saturday afternoon, April 6, 2013 at the fundraiser for the Long Island Toy Lending Center, organized by Project Pay It Forward of Long Beach. There was a good crowd at The Point Ale House to pitch in to help get the funds to rebuild the not-for-profit’s flooded premises. I didn’t win, but that GG (Gigi?)? either bought a bazillion tickets, or is really lucky or something! A stripped down but nevertheless cranking St Elvis provided the soundtrack for the day. 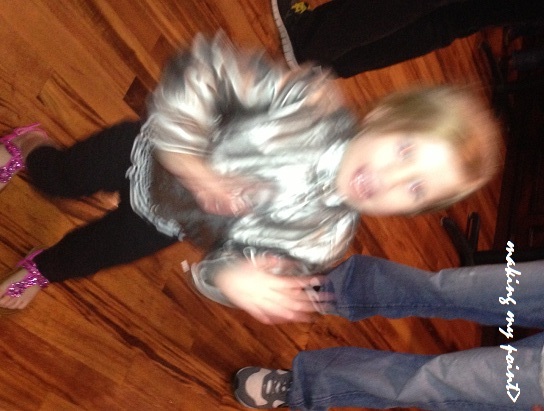 Everyone was struck by this cutie, Mckenzie Bender, who was showing her best dance moves. There was even some funny chatter revolving around Mckenzie’s shoes, (sandals) which it turns out several ladies were highly envious of. Someone promised me a better picture of her…obviously I”m still waiting!!! 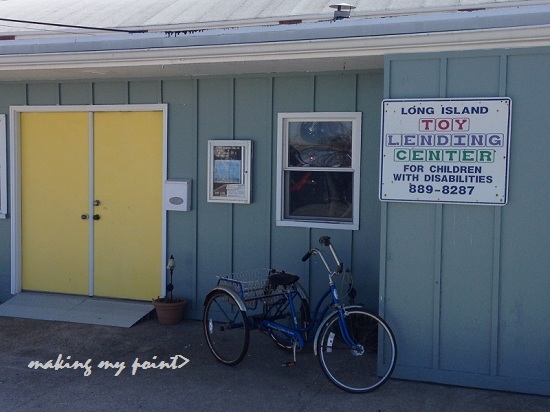 Colleen Moseman of Long Island Toy Lending Center takes it all in stride. It’s been a long road here and 5 months later they’re finally a big step closer to rebuilding. 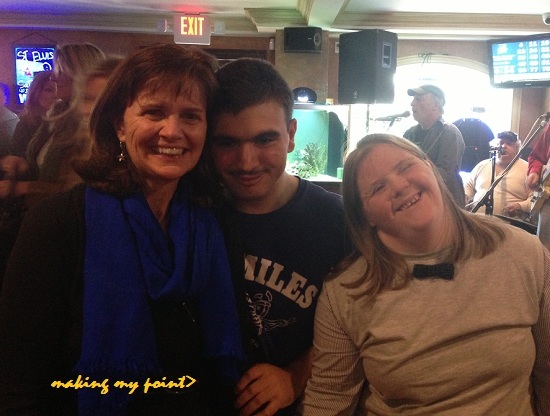 Colleen says the event “went really well” meaning a great amount was raised and the funds are mostly in place for the rebuild. There will be meetings and discussions soon and then rebuilding and literally raising the roof will begin. Donations can still go a long way to help cover expenses. 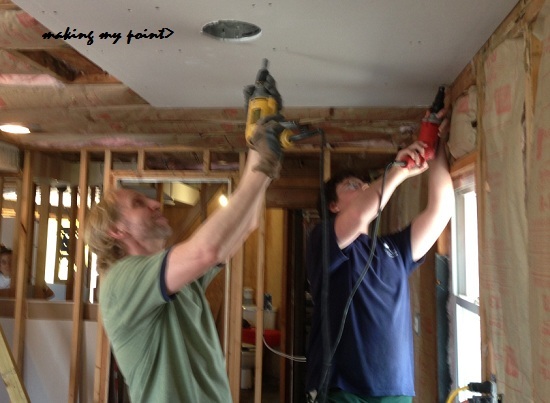 Helping hands are going to be needed for the rebuilding in the next few weeks. Copy n paste that and replace the “at” with “@”. 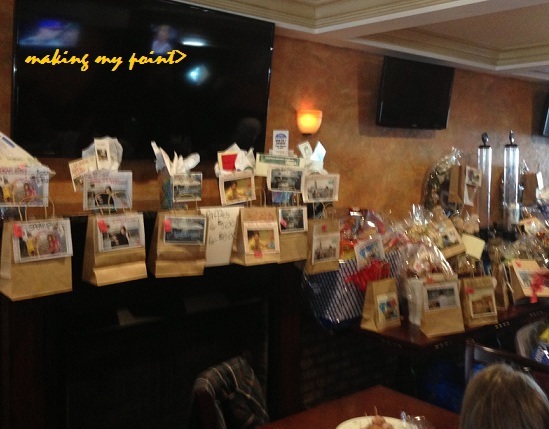 Project Pay It Forward of Long Beach will be holding a fundraiser to benefit The Long Island Toy Lending Center (LITLC) for Children with Disabilities whose location at the Town of Hempstead East Marina was wrecked by Superstorm Sandy. 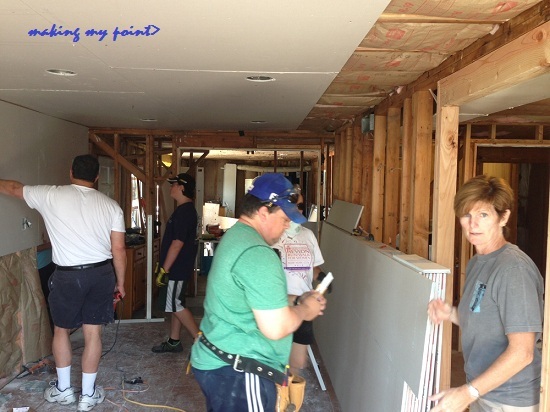 I’ve kind of been following and have seen Project Pay It Forward of Long Beach really doing great things in Long Beach getting businesses and offices that need help back up and running. I got this flyer at my door yesterday. Probably right about the same moment they were running their fundraiser for Shines in Long Beach. 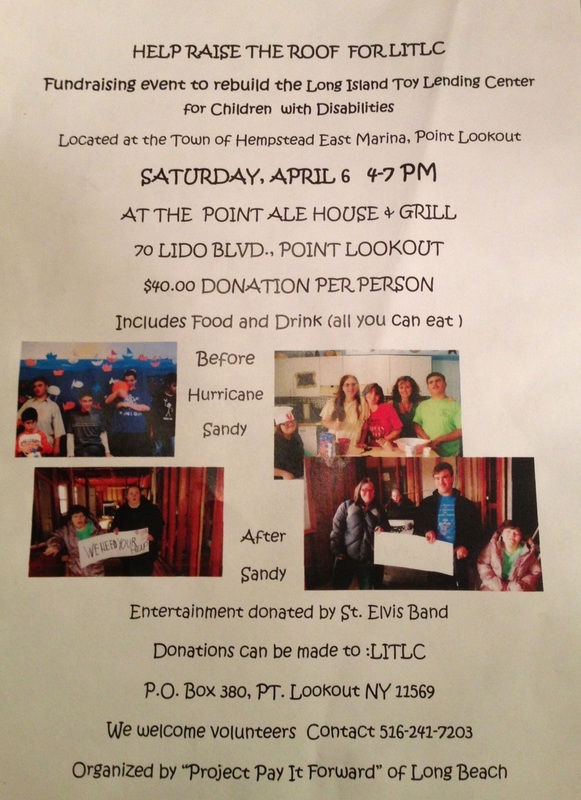 Saturday April 6, 2013 4pm-7pm at The Point Ale House. Donation $40 per person includes food and drink. St Elvis will be providing the entertainment.